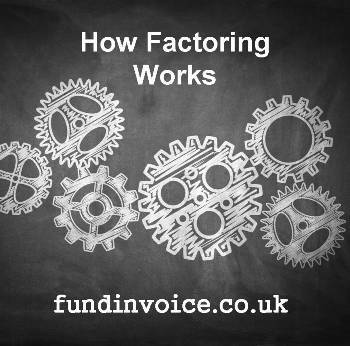 FundInvoice | How Does Factoring Work? If you want to understand "how does factoring work" this article will answer that question in some depth, providing a detailed, step by step explanation of how factoring works. This is essential guidance to be aware of, if you are thining about using these kinds of financial services. The first thing you need to do is to get a factoring account with a factoring company (also called a "factor"). There are lots of different option and types which are explained in our recent article. You can use a broker to advise about the different options, or you may decide to make that choice without taking any advice. Please note that the remainder of this article is based on a whole turnover style arrangement (where you factor all your invoices), rather than a selective arrangement (where you select invoices to factor). The first step is to get in touch with some factors, but remember that the product offering, funding levels, service levels and pricing may differ significantly between different providers. Most factors will have a team of sale people, often called Business Development Managers (BDMs) or Business Development Directors. They are normally spread geographically around the country, but their roles may also be split according to product, size of business or sector. For instance there are normally specialist sales people that handle the construction sector. The sales staff may work from local offices, or from home. Their job is to identify and acquire new clients for the factor. In many cases they have to find their own new business leads e.g. from networking etc. but in some cases they receive their leads from their organisation. So in the first instance you will need to speak to one or more BDMs in order to get one or more quotes. In some cases, such as smaller independent providers, it may be a Director of the business that deals with you as they may not be large enough to warrant a sales team. The BDM is likely to talk to you over the phone initially, and then to visit you (at least once - depending upon the process of a particular provider). They will discuss what you need, arrange for you to receive a quotation, called an "offer letter" and then take you through the process of becoming a new client. The type of invoice finance product that you want e.g. recourse factoring. Your business sector or trade (this can affect the level of risk that the factor perceives they are taking, hence the price). Your annual turnover, both actual (what you achieved in the last year) and projected (what you expect to achieve in the forthcoming year). The number of active debtors you have on your sales ledger (those with balances - invoices- outstanding). The average size of your invoices. This can be calculated by dividing your turnover by the number of invoices raised in that period - for example £1,000,000 of annual turnover by way of 1,000 invoices gives an average invoice value (also called the AIV) of £1,000. If you are a new start company the costing will normally be based upon your projected values for the above. The sales person is going to require more information than this to complete the process, but that should enable them to undertake a costing, and arrive at a quotation. Most factors will use a formula based approach to producing the pricing e.g. via a spreasheet costing formula for instance. The sales process may include a survey, which is a visit to take an in-depth look at the accounting records of your business. This may be conducted by the BDM in some cases, or a specialist surveyor. There may also be a take-on visit (although this may be conducted remotely) to acquire your debtor ledger in order to commence the arrangement. In some cases some of these visits can be combined into a single appointment. There are likely to be legal agreements that need to be signed (you are normally advised to take legal advice before signing anything) and various pieces of information, and documents that are required by the provider e.g. copy of your purchase ledger, identification for anti-money laundering checks etc. In many cases the provider will specifiy conditions that need to be met prior to releasing funds. These are called "pre-conditions", and they are normally specified in the offer letter. The process might sound very complicated but in some cases it can be completed in just a few days. So that can mean just a couple of days between your first contact with the sales person and release of funds into your bank account. You probably want to know how much do factoring companies charge? The way that the charges work is explained in detail on our site and you will find some examples of the cost of factoring. Service fee - a percentage or turnover or a fixed monthly fee. Discount charge - similar to interest, charged on the amount that you are prepaid (another term for the amount you borrow). Normally quoted as a margin over bank base rate or LIBOR. Other charges - there may be a tariff of other charges (or not in some cases) for things like CHAPs payments (a method of payment which gives you funds the same day). In some cases, a quote can be provided with a single fee, which includes everything (or almost everything in some cases - sometimes a CHAPs transfer will be extra). If you choose an transactional, selective style facility there are not normally any minimum fees to worry about. These are just examples though, and you will need to give your particular details to a provider in order to understand what the costs are going to be in your case. So on day one what happens when factoring? Well, if you are a new start-up company then you might raise your first invoice, which you then send or transmit to the factor. This is likely to be via an electronic interface of some kind. Some factors use software that integrates with your accounting package e.g. Sage, and extracts the invoices to send, others use simple file upload facilities and in some cases you may have to provide paper based documents (either hard copy, which is rare these days, or by email). In rare cases you may have to enter details of invoices into the factoring system. If you are already trading and therefore already have a ledger of outstanding invoices, the factor will take a snap shot of those outstanding transactions and create a "mirror sales ledger" on their system. Again, this can be via software to extract and upload your ledger, via electronic transmission of the items, or by manually visiting your office and taking copies of invoices. This sales ledger is the one that they will now use to drive their credit control activity, and to produce statements and chasing letters. Therefore it is important that it is accurate, and they will go to some lengths to check their figures reconcile to yours. General notice of assignment letters, signed by you and on your headed paper, will be sent out to all your customers advising them of the new arrangement. You will normally be asked to add an assignment clause to all future sales invoices that you raise, unless you are using a Confidential Factoring facility. All new incoming cash from customers will be posted to this ledger, adjusting the balances accordingly. Once invoices (and credit notes, plus any unallocated cash) have been processed to the mirror sales ledger, the factor's system will generate an "availability" figure. This is the amount of funding that you are able to draw down. Discount charge: 2.5% over base rate of 0.75% = 3.25% per annum. On day one, lets say you have a balance of £100,000 of invoices on your sales ledger, and you are receiving an 85% prepayment. Assuming that all the invoices are covered by funding limits (credit limits on each debtor - the maximum value of invoices that can be outstanding to that debtor and still attract funding). The calculation, to work out your availability would be £100,000 x 85%, which creates an availability of £85,000. The fees in respect of those invoices may be withheld from that availability e.g. £100,000 x 1% = £1,000. (+ VAT if applicable). Any reserves will also be withheld from that availability. A reserve could be a defined value withheld from availability to account for some risk factor, for example the presence of contra accounts on the sales ledger. A contra account is one where you "contra trade" i.e. you buy and sell from the same business. The risk to the factor is that a contra account can offset the value of any invoices owed to them against what they owe to the factor's client. A contra reserve could be set at a level to account for the normal level of unpaid purchases that have the potential to be offset against sales invoices. For example, if you have £20,000 of sales invoices to a customer, and you owe them £2,000 the potential contra offset is £2,000 i.e. the customer could just pay the £18,000 net balance. Therefore, the contra reserve could be set at £2,000. Alternatively, some factors may choose to unapprove such accounts (and they may unapprove invoices for other reasons e.g. if they are old) i.e. they become unapproved for funding, so generate zero availability. Some providers use the term "disapproved" rather than unapproved. Exclusions are invoices that are excluded from the funding formula. Technically the word "excluded" sets them outside the arrangement, so in many cases they may be classified as "not notifiable", or "not notified", which means they are still technically captured by the facility (so form part of the factor's security) but they are not advised to the factor, hence are not funded against. For example, this could include sales to private individuals or cash sales. A prime debtor restriction (PDR) is a funding restriction to ensure that the level of funding against any one customer does not exceed a certain threshold. There are different ways of calculating the prime debtor funding level but the simplest method is as follow. If the PDR is set at 30% that means that the largest debtor will only be funded up to a maximum of 30% of the sales ledger. So in our example, if the invoices to the prime debtor were £30,000 they would all be funded, if there was £31,000 outstanding to the prime debtor, £1,000 of that invoicing would not be funded against. Note that for with some factors, the actual calculation differs, adding another level of complexity. Also the PDR may operate against just the biggest debtor or all debtors that exceed its biting point. After accounting for any reserves, PDRs, unapproved and exclusions (if there are any), you arrive at the availability figure. Any previous prepayments, known as the "current account" (the amount you owe the factor) are deducted from this figure, to give a final availability figure. This is the amount that is available for you to draw down. Normally, if you don't draw down any availability you would not incur any discount charge (which works like interest on your utilisation of an overdraft). Discount is normally levied only on the funds that you choose to drawn. You can either set up an arrangement to transfer availability to you e.g. transfer what is available on X day, or once more than Y is available. Alternatively, you can request funds either by phone or more often via the factor's electronic interface. You can have the funds transferred into your bank account by a number of methods. These days many payments are transferred by same day payments but in some cases a CHAPs transfer will attract an additional fee to achieve same day value. BACS is normally used as a free method of transfer - although some charge for a BACS transfer - but the payment will be subject to a few days clearance). The factor then gets on with the job of undertaking the credit control, on your behalf. At best this will be a fully outsourced service, such that you need do nothing yourself. However, the service provided differs between factors. At worst it will be partial collection from the largest debtors on the ledger, with you having to supplement the service with your own resource. The credit control process will normally include sending debtor statements of account, sending chasing letters where required and making phone calls to customer with overdue debts. There will normally be reports available to you to show how this is going, and the credit controllers are likely to liaise with you over any issues that they encounter. What Happens When A Factored Invoice Is Paid? The customer pays into the factoring company's bank account, using references that distinguish the payment as for your account. The factor will then allocate the payment to the relevant invoice(s) on the sales ledger. Payments can be received by any method e.g. cheque or electronic transfer. Some factors can deal with direct debits and credit card payments. The invoice for £1,000 is processed, assuming its covered by a funding/credit limit it is subject to funding - the value of your sales ledger is now £1,000. At 85% prepayment it would generate an availability of £850 (ignoring any charges or other deductions for ease). You draw the £850 (by requesting it is transferred to your bank account) so your current account with the factor is now -£850 and your availability with the factor is now £0. You begin to incur discount charge in respect of the prepayment until the debtor pays. The debtor pays £1,000 cash to the factor's account to pay the invoice, say 30 days later. The sales ledger value is now reduced to £0. You stop incurring discount charge at this point. £850 of the cash received reduces your current account with the factor to £0, and the remaining £250 puts your current account in credit +£250. This credit balance on the current account creates a further availability of £250 - ignoring the fees and discount charge. You can then draw the £250, again requesting that it is transferred to your bank account, and your availability is reduced to £0, your current account is also £0 and your sales ledger is £0 (again this ignores the effect of the charges for ease). You don't pay discount on the £250, as its not a prepayment. In the above example the discount charge accrued would be calculated as follows. Assume that the £850 was prepaid for say 30 days i.e. there were 30 days between you drawing the availability and the debtor paying. At a discount charge of 3.25% (which includes base rate) the annual discount charge would be: £850 x 3.25% = £27.625. But that's for a whole year, say 365 days - so to work out 30 days discount you would divide the years discount by 365 days, and then multiply by 30 days. This example give rise to a discount charge of just over £2.27. Note that not all funders work on a 365 day calendar, some will use an alternative number of days e.g. 360, which will marginally increase the discount charge. What If The Customer Doesn't Pay? What if the customer doesn't pay? Lets assume that they recourse period was 90 days from the date of the invoice. If the debtor still hasn't paid after 90 days from invoice date, the invoice is "recoursed". This means that any prepayment is withdrawn. In the example above, at the point that you had drawn the £850, should the debtor not pay after 90 days from invoice date, the £850 will be removed from you availability as the invoice is no longer eligible for funding, by virtue of its age. Technically you could be asked to repay the £850 but in practice, with a trading business there are likely to be more invoices raised and the prepayments against these will offset any liability. Some factors charge a refactoring fee at this point where you have to pay an additional amount - not all providers do though. The alternative is to seek a non recourse facility where you have protection against bad debts and recourse does not occur. Despite how complicated the factoring process flow may appear, in practice it is normally a very smooth process with little need for the client to interact with the factor, beyond drawing down cash. Our research found that 98% of existing users of these products were prepared to recommend the service to other companies,which speaks volumes about the high levels of satisfaction that they generally enjoy. The key is finding a provider that can offer the type of service, approach and rates that will suit your company, and a good factoring broker, such as ourselves, can help you with that.